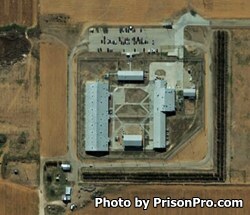 The Jim Rudd Transfer Facility, sometimes referred to as 'Rudd Unit', is a minimum security prison located in Brownfield Texas, part of Terry County. The facility houses approximately 612 adult male offenders who range from G1 to G2 custody levels. Rudd Transfer Facility consists of 10 buildings that provide housing, various educational programs, laundry facilities, cafeteria, kitchen, recreational space and basic medical treatment. Located on over 300 acres, Rudd Transfer Unit operates a unit garden, is utilized for contract farming, and assists in the care of security horses. Inmates who have been assigned to the Rudd Transfer Facility and do not currently possess a high school diploma are encouraged to take literacy, adult basic education and GED courses. Additional classes provided include cognitive intervention, life skills, substance abuse education, and a pre-release class called CHANGES which helps prepare an offender for an upcoming release. Select inmates are provided work opportunities in maintenance of the facility. Inmates who are located at the Rudd Transfer Facility are allowed a single visit each week, limited to a two hour visit on either Saturday or Sunday from 8am to 5pm. Visits are contact up to three times per month, if you visit a fourth time during any month the fourth visit will be non-contact.